A superb machine for the price, even if it does have a few let-downs. 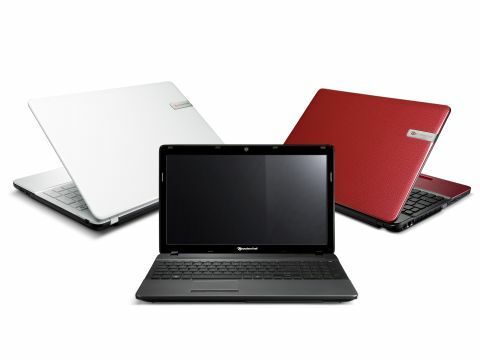 It would be fair to say that we were a tad skeptical when we got our first look at the Packard Bell EasyNote TS. It's ostensibly a pretty laptop without much obviously going for it bar its shiny lid, so we were a little bit dismissive – that's the sort of stock response we reserve for anything in the sub-£500 bracket. Perhaps – and this does take a certain degree of humility to say – we shouldn't have been so hasty. Because while it's not up to the lofty 3D standards of the Sony Vaio F Series and it doesn't have the leg-melting power of the high-end Apple MacBook Pro, the EasyNote TS is a mid-range performer at a low-end price, and absolutely the sort of laptop we'd be happy to welcome into our own homes. And we see a lot of laptops, so that's no mean feat. Packard Bell was kind enough to send us the Ebony Black edition, perhaps to save our blushes at carrying around a coloured laptop, and having fully inspected the daisychain pattern – which also spreads over the wrist rest on the front of the case – we'd had to rescind our earlier assumption that this is in any way 'girly', at least on black; it's an utterly unisex pattern. Honest. It's a bit Louis Vuitton, if anything. There's a pretty nifty chiclet keyboard spread across the entirety of the EasyNote TS, with a numerical pad, which is truly unusual for a laptop. It does mean the main typing surface is pushed over to the left of the unit, although the gesture-enabled trackpad (which is slick, responsive, and has a scroll section cleverly separated from the main body by a raised area) has been moved to match, which we applaud.